Frontier Wilderness Campground has so much to offer: convenient location, varied campsites and abundant activities. The grounds are well-cared-for with clean facilities. And the owner’s enthusiasm for running the place truly shows in overall feeling and service we perceived. We love when we see that in owners! Frontier Wilderness Campground posts directions and a map on its Web site. As you head north on Hwy. 42, you’ll pass Cty. Rd. I. You’ll see a sign on the east side of the highway, “Campground,” before you see Hillside Road. Turn right and travel for about one mile until you see the “Welcome to Frontier Wilderness Campground” sign and property on your right.Check in at the office/store. You can purchase items ranging from bottled water to napkins, candy and snacks here. We thought the inclusion of Wisconsin ice cream (made by the Chocolate Shoppe, Madison) was special. A variety of flavors are featured in the case including the kids’ favorite, blue moon. Oh, and wood for your campfire is conveniently sold at Frontier Wilderness Campground, too.Don’t forget to get your copy of the Frontier Wilderness Campground map. It gives you the lay of the land on this 40-acre site. It also includes ads from area farm markets, grocery shops and restaurants and a list of upcoming events at the campground.The office/shop also has a bulletin board where you can see things to do and even trailers for sale. Brochures about Door County attractions are here. This building was recently updated with new composite decking on the outside and a new interior floor. The property has 240 sites, including 170 seasonal sites (reserved from May 1 to Oct. 31, when Frontier Wilderness Campground is open). So, there are 63 weekend/overnight sites from which you can choose. There are also seven cabins nestled on the grounds; read more about one of them below. A blacktop road runs north and south through the grounds, and various gravel roads with names like “porcupine point” and “possum path” connect to it. The sites are available on a first-come, first-serve basis. They vary slightly in size and shape. Each site includes water and electric hook-up services and picnic table. High-speed Internet is accessible throughout the property. The sites are large enough for a 40-foot trailer. There is a gravel area for parking, and surrounding it are tall trees. We liked the combination of shady area and sun. The trees also provide a nice privacy barrier between the sites. “With a 40-foot trailer, people want spots that are open. There are still some trees around. But the trees are not real close (to the open area). So, you can pull in and not have to worry about scratches from branches,” said Todd Rasmussen, Frontier Wilderness Campground owner. Frontier Wilderness Campground has received one of Woodall’s Camping Directory’s highest ratings, 4W, for their facilities. And Frontier Wilderness is one of only four privately owned campgrounds in the Woodall’s 2010 Directory to earn that achievement. Use the Frontier Wilderness Campground map to choose a site. Some are closer to playgrounds (there are three). And if you have children, you may want to be near one of them. Other sites are closer to toilets and showers/changing areas. The deluxe cabin is one of seven structures that sit on the campground. It has one bedroom and a living area. The bedroom is actually a 2003 addition; it has bunks on each side. More people can sleep on the futon in the living area. The campground promotes space for up to eight; that would require sharing bottom bunks and futon. There are knotty pine walls and a microwave, refrigerator, countertop area and a TV with VCR/DVD. You need to bring your own linens for bedding, dishes and whatever else you need for camping. Water and rest rooms are nearby. We found it to be clean and fresh, and we liked the additional outdoor amenities: attached deck and separate buildings for screen porch and firepit. Note: some cabins are pet-friendly, so please ask when calling. They have 7 “rustic” cabins as well, which are pretty cool. See photo. Toilets can be found throughout the property. The flushable ones are available near the showers and changing areas. There are four for women—separate and private stalls, one sink and a nicely tiled and cleaned area. Nearby are the showers: women are asked to use the ones on the left and men the ones on the right. Each shower is in its own private room, so you have privacy. There is a small bench inside the room for placing your toiletries and clothes. Just insert 25 cents for a five minute hot shower—a good idea for conservation even if you didn’t have that coin machine at home. “We keep everything spotless,” Todd said. There are also changing areas—private rooms with a sink and space to get ready separate from the shower. That’s a nice touch for saving time on busy mornings. In addition to these amenities there are five pit toilets for men, and five for women located throughout the property. These pit toilet rooms have an outdoor and interior lighting, tiled floor and a pit toilet. The door locks. Inside, a hand sanitizer is on the wall—a nice touch. And there is even nice landscaping of rocks and plants around the pit toilet building we saw. Also good to know is that the Frontier Wilderness Campground has a laundry room. It includes two washers and three dryers. Some of the dryers are older, but they are marked and cost less. The owners recently updated tile in this area. There are indoor and outdoor areas for activities, as well as organized events. So there’s lots to do! The indoor pool is a nice size with varying water depth and space also for sitting alongside the pool or at a table. It connects to an outdoor deck. The Activity Center is a large room outfitted with many tables and more than a dozen arcade games. This area is used for “craft for the kids” events and other occasions. It even has a small indoor playground area, where toddlers can enjoy the equipment. We liked the kitchen in the Activity Center, which the Frontier Wilderness Campground makes available to parties that may want to get together in this larger room and use the kitchen (microwave, stove and refrigerator are here). There’s an old console television here, but a much newer style in the Adult Center (21 and over). Leather furniture and more furnishings were part of a 2005 Adult Center makeover. The room has a pool table, two computer work stations as well as a bistro-style table which seats eight. Games and books are available for guests to use, as well. Outdoor attractions include a nine-hole mini golf course (remodeled in 2006 with new hole designs). That’s pretty cool. The three playgrounds are adorable, and each is a little different and updated with bright and fun activities. They have rock walls, slides and swings. The one closest to the office/store has a sandbox for toddlers and a nearby covered area, where parents can watch all the playground action. “We are very family-oriented. That is how we run our business. We try to make Frontier Wilderness the destination, and that is why we have so much for people to do here. If you don’t want to go out, we have enough,” Todd said. The campground sponsors a Summer Olympics, Pig Roast and Campground Halloween. Some events, such as a chili cook-off, benefit local first responders. Frontier Wilderness Campground provides easy access to other Door County attractions including places that Todd likes to recommend: Peninsula State Park, Fish Creek, shopping in Egg Harbor and Fish Creek, lighthouses and more. “Our guests are coming to Door County, but we try to have them have a good experience here,” Todd adds. Door-County-Camping.com and its parent site, DoorCountyNavigator.com, believe your experience at Frontier Wilderness Campground will indeed be a great one. If you’re a camper or someone who wants to give camping a try, give them a call, and let them know Door-County-Camping.com and DoorCountyNavigator.com sent you there. See my review and rating system. 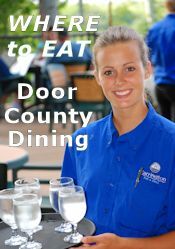 And please tell them that Door-County-Camping.com and DoorCountyNavigator.com sent you camping with them!